Administer rebates…since large pharma companies (e.g., Pfizer) pay rebates for having their drugs on formulary (aka preferred drug list), someone has to manage the negotiations and billing of this. And, last but not least, most PBMs provide a mail order and often specialty pharmacy where they ship prescriptions to patients. The PBM’s clients are employers who are self-insured, government entities (i.e., state employees, DoD), unions, TPAs (third party administrators), and managed care companies (i.e., BCBS of). 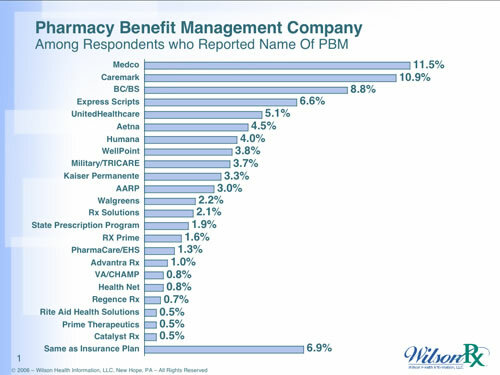 Since healthcare has not traditionally been a consumer focused business especially in the PBM world, many of you might not know who your PBM is. In some cases, the managed care company may make it basically invisible to you. The only people that likely have good awareness of their PBM are high utilizers who run into lots of claims questions and/or people who use the mail order service. WilsonRx does surveys around PBMs Learn More. 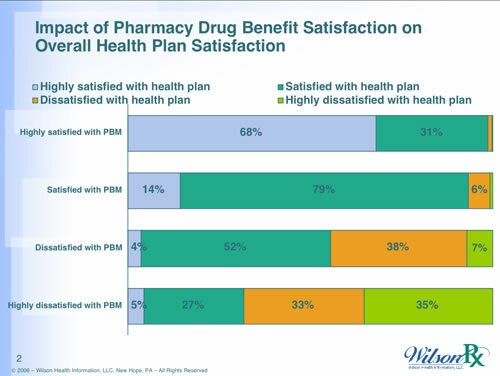 Here are two charts from their website about who people name as their PBM and satisfaction with their PBM. If you like this post and are interested in the topics here, don’t forget to sign up for my e-mail updates or add the RSS feed from the blog to your reader. Where would Costco fit into all this? I’ve heard good things about their presription drugs, as well as having good prices. I was doing some research regarding Healthcare ISVs in the following segments: Pharmaceutical Benefits Management (PBM), Health Insurance, and Hospitals. Is there anyone who could tell me who the top three ISVs are in each segment? PBM’s are the much required focal points that bring together pharmacies, patients, plans and employers. Without PBMs, other entities would face increasing challenges in providing affordable drugs in the absence of PBM negotiated prices. I can not agree with you in 100% regarding some thoughts, but you have got a good point of view. Thanks for your thoughts.